Put to boil all the above for the sauce ingredients and heat up till cooked. 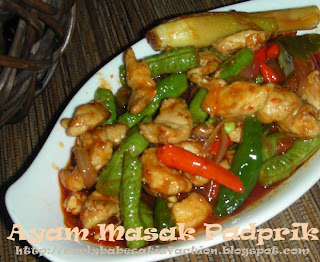 Adjust to taste, it must be sweet and sour some how like the chicken rice chili sauce taste..
Leave to cool. Pour or dip into tauhu..
2 days our noses were stuck with the cempedak smell...uh!!!fooooh!!! cannot tahan...!! the whole house, smells cempedak.. Mix all the above to form batter, not too thick not too runny. the amount depends on how much cempedak needed. Heat oil in wok. 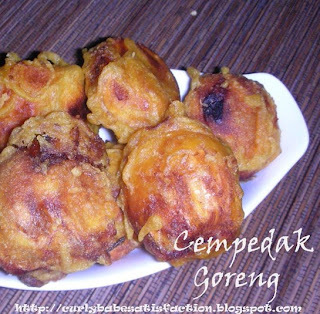 Dip the cempedak 1 by 1 in batter and deepfry in wok till golden brown. Serve hot with hot coffee... sleepy eyes will open widely...heheheh.. Beat butter, sugar, vanilla essence and ovalette till 'kembang' and add eggs 1 by 1. Preheat oven and bake at 170c/160c degrees for 30 minutes and bring down the temperature to 150c degrees and bake for another 30 minutes or till cooked. Using double boiler method cook whipping cream till hot(not until boil), add in butter,cooking chocolate and stir till chocolate melt. let it cool down before decorate the cake. Heat oil in wok .Dip slices of bread to eggs, making sure all covered. Fry the dipped bread till golden brown. Ready and serve. Yesterday, made new glasses for Iqram. Degrees went up by 50 on the right side, so now 250 and left remain the same at 200. Quite high for his age...He has been wearing glasses since he was 4 years old.. went to polyclinic for his developmental screening and was referred to KK Hospital for eye check up... last time the doctor told me that by 8 years old I can decide for him whether to wear or not his spectacles...but it seems now degrees increase how to not let him not wear..? 1. Boil gula melaka together with water till melt. Filtered and put aside. 2. Beat eggs, vanilla essence and sugar till fluffy. Add in flour bit by bit and stir well. 3. Add in melted butter together with gula melaka syrup and stir well. 4. Brush mould with butter. Pour some mixture till half of mould. Add in slices of bananas onto the mixture. 5. Steam for 15-20 minutes. Cool first before take out from mould. 4. Roll out and wrap with desired fillings. Shape as required and let it proof on lined or greased baking tray for another 50-60 mins or until dough is double in size. 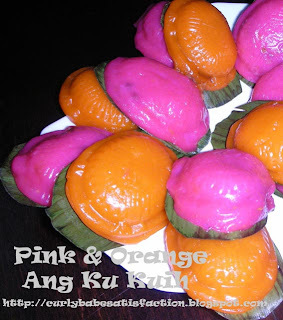 Last week I bought some sweet potatoes, thought of making Ang ku kuih again. After I bought them, I just chucked one corner ....my mum keep nagging when I want to make the ang ku kuih before the sweet potatoes turn bad..so yesterday managed to make them but realised there's no more red colouring.... no choice but to use 'rose pink' and my mum said try some orangelah...the pattern didnt really turn out clear and sharp ...still need more practices...while making, Mr Hubby has to take care of Marsya...hehehehe.... I think he cannot tahan already...cause very tired to take care that 'hyperactive girl'....well at least he knows that it is not easy to take care of her although I am not working...its hard work ok!! 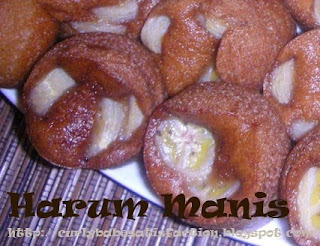 !huhuhu...anyway for the recipe can check in my older post in January. 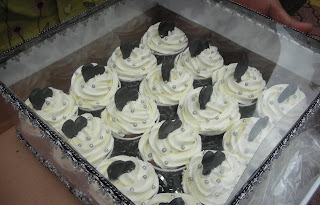 Thought of posting what I did last year.Some maybe have seen this decorated cupcakes, I made for Mr Hubby 's brother's daughter's engagement gift( to be given to the guy's side). So considered my niece lah...well for information actually this niece(final contestant for Miss Universe/Singapore forgot which year) is engaged to the national footballer, cant remember his full name, but it sound like 'Amri', who just won some award think some sports award... Anyway her mother, who is my sis-in -law, 'arrowed' me to do this cupcakes when she heard that I took some class in baking... I was a bit like'no confidence' in taking the task..wah lau!..thought to myself...don't play- play this is no joke business....sekali salah..how? My 'image' will be ruined, and of course theirs too. Then after their persuasion, and thought for a while, maybe this the time to show my 'skill'...I accepted the challenge. For one month, I had sleepless night thinking and worrying about the cupcakes..when I asked my niece, what colour scheme she's having, she said black & white. She said she has some ideas of what she wanted, and suggested me to go to this website that do wedding cupcakes... wah stresslah... some more she specifically (did I spell correctly) wanted this particular cupcakes.. anyway thank god..all went well. I made it.. Yup!! My bread maker is back!... I made this pizza(the dough) yesterday afternoon, but due to some circumstances, I only managed to bake it late night. the Malay version you can get it here. Thank you ya Che Mat. Marsya is showing the early signs of 'croup' (the infections of the air tube) she is coughing like a seal..she vomited the whole dinner that I fed her!. I think need to bring her to see doctor today. I was wondering what was the cause for her to be like that...was it she cried and shout too much? or the food that she ate? or was it the milk?Hai.. the paediatrician surely will give her some oral dose and this will make my life so difficult!!! 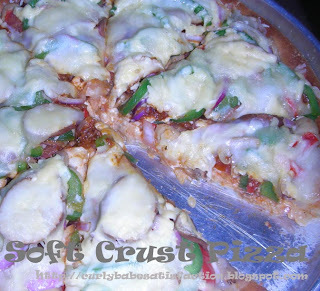 FOR PIZZA:-Take dough out knead for 5 minutes and put dough on pizza pan which has been greased with margarine.Press dough slightly with fingers and push towards the edge of pan.Let the edges slightly thick. Preheat oven and bake for 200c degrees for 20 minutes. Take the crust out and top with sauce, followed by the toppings , Parmesan cheese,cheddar cheese and lastly mozzarella cheese. Made this for the kids yesterday. Hungry from school, Hasif who just got back from his Robotics like the cheese fries while Iqram who is in the afternoon session prefered it plain. The cheese I should say is not the same like those in KFC,(which I prefered) the colour is not yellow and for this it was a bit saltish..maybe should add little bit more milk. (lucky didnt add salt to it). 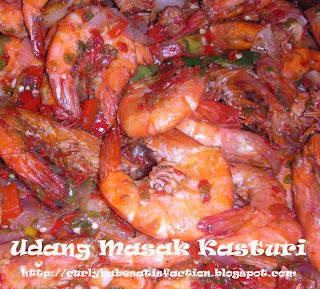 Well after all not that badlah...recipe from 'resipidiana'. Arrange on plate. Using a non-stick pot, add cheese, milk to cook. Turn heat to medium heat to simmer for 3-5 miniutes, stirring continuosly into liquid form, once its melted into liquid turn off the heat. Pour melted cheese on fries. Whisk sour cream with milk till its creamy. Drizzle on top of melted cheese. Sprinkle spring onions and serve immediately. 1) Heat blended ingredients till fragrant. Add in turmeric leaf and kaffir leaves and stir for a while. 2) Next add in tomato sauce, lime juice, sugar and salt to taste.Stir well. Let the sambal thickened a bit before turn of heat. 3)Banana leaves cut to sizes of fish, same goes to aluminium foil.Better to make it bigger then the banana leaves. 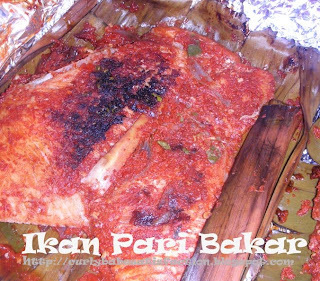 4) Layered the banana leaves on top of aluminium foil and scoop some sambal. Add the fish on top of the sambal and top with another layer of sambal.Wrap it nicely and make sure all the dish are covered. Beat eggs together with sugar till fluffy. Add in vanilla essence and beat. Add in ovallete and beat again. Alternately add in flour and milk beat till soft peak. Divide into 2 or 3 portion(depends on how many colours used). Add in colour to 1 portion and stir well. Put each portion into a different piping bag. (Me just used spoon to scoop.) 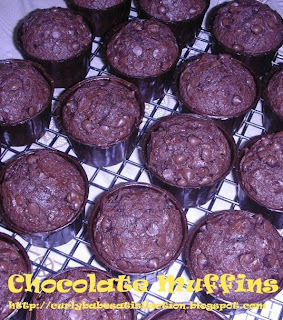 Put paper cups in muffin tray and add in portions. Steam for 10-15 miniutes. Ready to be serve. This was one of the dish that I cooked for the occassion. Got the recipe from 'cookerypot'. First time tried, and straight away feed 40 pax for that night. 'Heng ah'!!! I told myself..this dish is ok! Prawns washed and cleaned. Marinate with lime juice and salt. Put aside. Chillies to be pounded or just use the dry blender and blend coursely. Onions sliced, tomatoes cut quarterly. After baking, maybe the muffin will be slightly soft(cause little usage of flour) but when its cooled it will be hardened by itself. So if after 20 miniutes still soft dont have to bake again. Ah! enough of the fanfare..hehe got back to work. 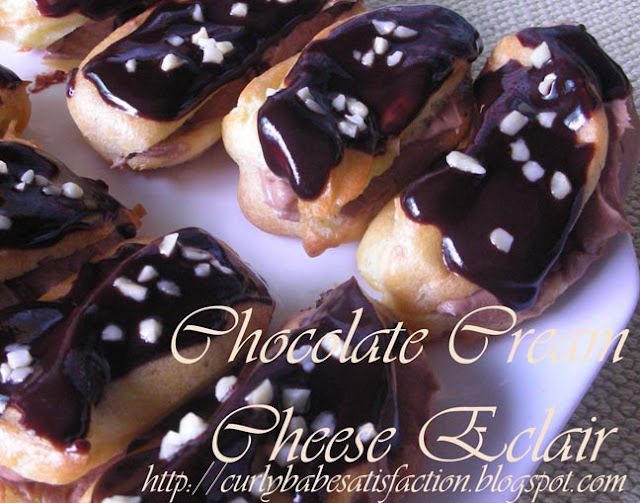 Made this chocolate eclair cause I feel like eating something chocolately. If we were to buy this from prima deli, to combine two of my eclairs at least it will cost about $1.80 per piece. I manage to get about 30 pcs of this sizes. I thought it was quite 'leceh' considering the steps given..but as long as you prepare the ingredients and equipment earlier before starting work, job was done within 2 hrs! Put it in the fridge and to me it taste almost like the ones in the shop...ermm can have this for breakfast..or tea break. Recipe from 'auntyyochana'. 1. Boil water, milk and butter in a pot till rolling boil. 2.Pour in the plain flour immediately and stir vigourously with a wooden spoon. 3. Leave paste to cool till lukewarm and transfer paste into mixing bowl. 4. Beat with a 'K' beater , add in eggs one at a time till blended. 5. Place mixture into a piping bag fitted with a star nozzle and pipe a strip onto tray. (put greasefroof paper). 6. Preheat oven.Bake at 190C for about 20 mins or till brown. Do not open the door while the pastry is baking or else it will collapse. 2. Mix instant custard powder with fresh milk. 3. 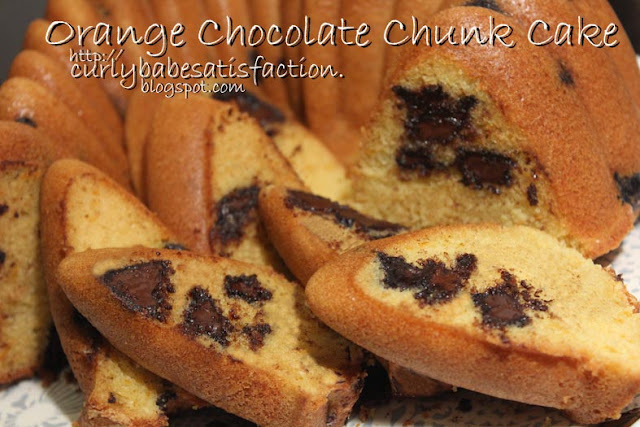 Pour in melted chocolate into cream cheese mixture and mix well. 5. Slice puff intp half and then pipe chocolate cheese mixture onto it. 6.Scoop a spoonful of chocolate decorations on top of eclair and then sprinkle sprinklers . You can sprinkle anything of your preference, eg. almond nibs or chocolate rice. Welcome my friends.. to my humble 'home'. 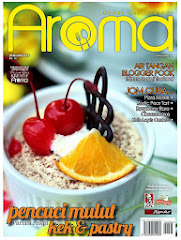 Feel free to browse through my blog and leave comments ya. Hope it is just another website that you will add in your favourites as reading and 'washing your eyes' pleasure. Although I left my designing job almost 2 years ago, I still felt that design and cooking are more or less 'related' especially after seeing the 'end product' turned out 'beautiful and nice' and you feel satisfied with your creations and getting the compliments from your 'clients'. I also felt that by making or doing something new in my stay home life especially in baking and cooking has made my life more fulfilled and 'complete'..something to look forward to and worth it after seeing my kids love the cakes,bread and cookies that I made finished.. Of course with the help of my husband, dad and mum. They started to compliment me and said 'ermmm sedap' especially from Mr Hubby (who at first DOUBT my capabilities) and mum( who is very FUSSY in eating traditional kuih). 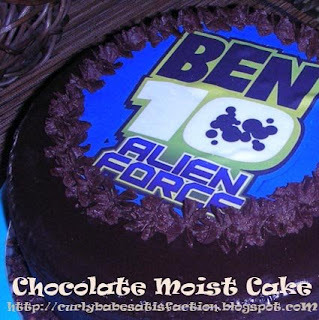 My kids would love anything that's CHOCOLATE... so as we go along in my blog, most of the cakes recipes are made of chocolate cause me also 'HANTU CHOCOLATE'...!Besides posting about food, I will somehow post about my life, family and things which I think I can share in this blog.The journey of my cooking and baking, the trial and error, the ups and downs of my new experiences.. Its like an e-diary for me too only thing that people can view the content...please don't mind the mixed of Malay & broken English in my blog..
With this I declare my blog officially OPEN..
3. 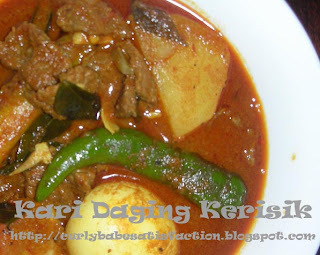 Masukkan daging rebus bersama air rebusannya sekali dan juga kentang. Bubuh garam,asam gelusur, kerisik, kacau rata dan masak hingga mendidih. Tambah air jika perlu dan masak lagi biar mendidih dan kentang empuk. 4. Kecilkan api dan masukkan cili hijau dan tomato. Renihkan lagi 10-15 min. Siap untuk hidangan. This is my kids favourite dish. Especially Hasif, he can eat double bowl of rice with this dish. Got this recipe from 'koleksi resipi pilihan diana'. 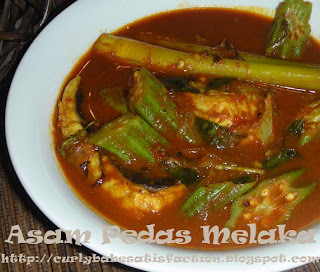 The taste a bit like tomyam cause of the daun limau perut and serai. They like the chicken but left the veggies to me..
Sunday is cooking day! From morning, made breakfast to lunch and sometimes afternoon tea to dinner. Wow.. so tired!!. what to do..if don't cook, we need to eat..if buy out, how much already? Anyway although tired I am glad that I can do it for my family..
Heat oil, fry the fried ingredients add in blended ingredients.